The new board is fast, friendly and fun ! I'm sure that once everyone who uses rosacea-support sees how much fun the new board is and how easy it is, many will want to move over and start using the RSCom. 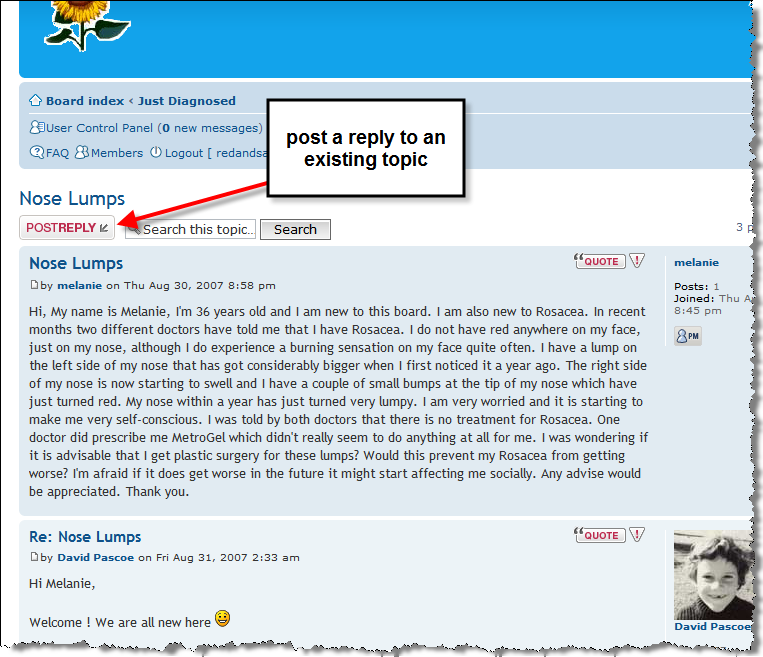 Forum-style posts appear immediately so you can join in a conversation quickly and easily. Whilst the email group at Yahoo!Groups does have a web interface, it doesn't group topics together well. 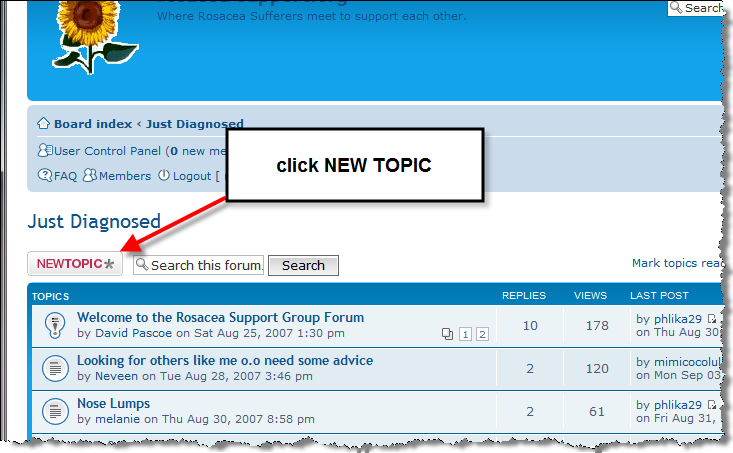 The Rosacea Support Community does a much better job of keeping a conversation together in one spot. So if you would like to try this new board, here is how you join. 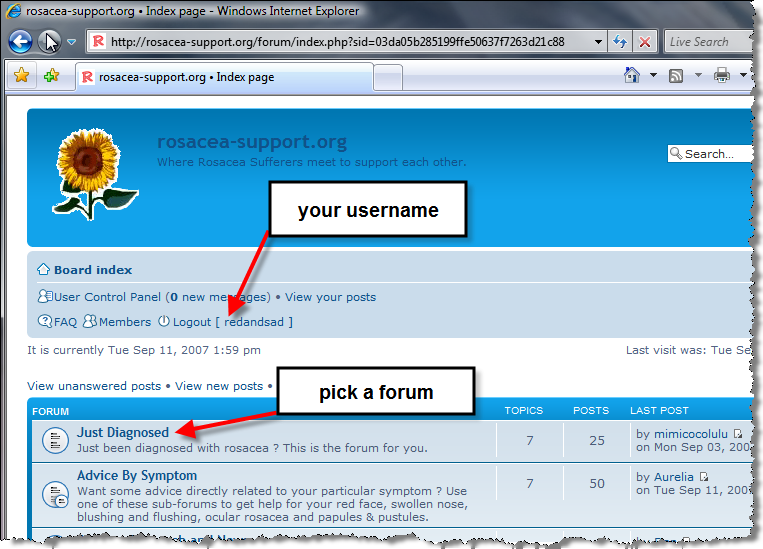 Once you get there you will see many of the familiar friendly faces from the rosacea support email group. There is a lot of detail here with lots of steps, but it is straight forward and very quick. Click on each small image to see a bigger one. 1. 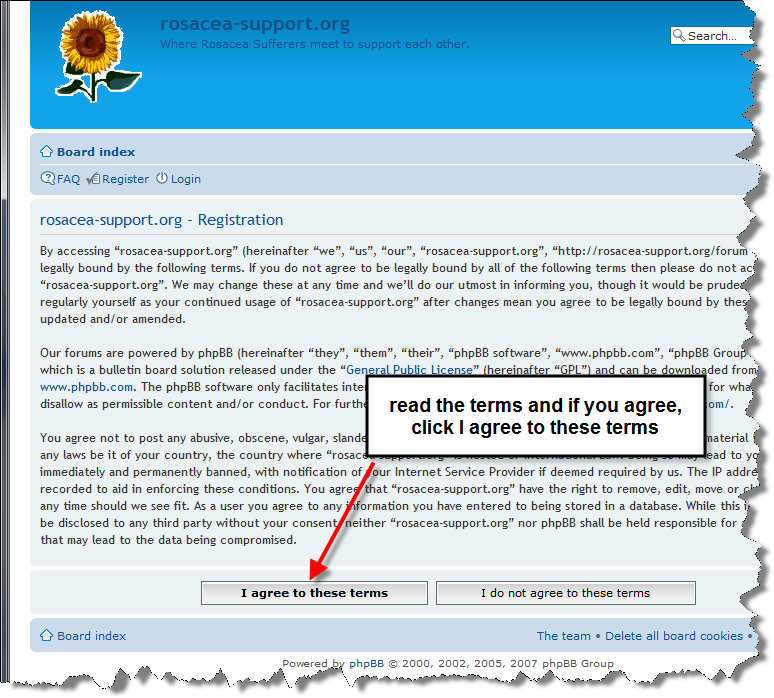 Go to the address http://rosacea-support.org/community and click on the Register link. 2. You will come to a page where you agree to behave nicely and not do anything offensive, unfriendly or illegal. Click I agree (if you do . 3. 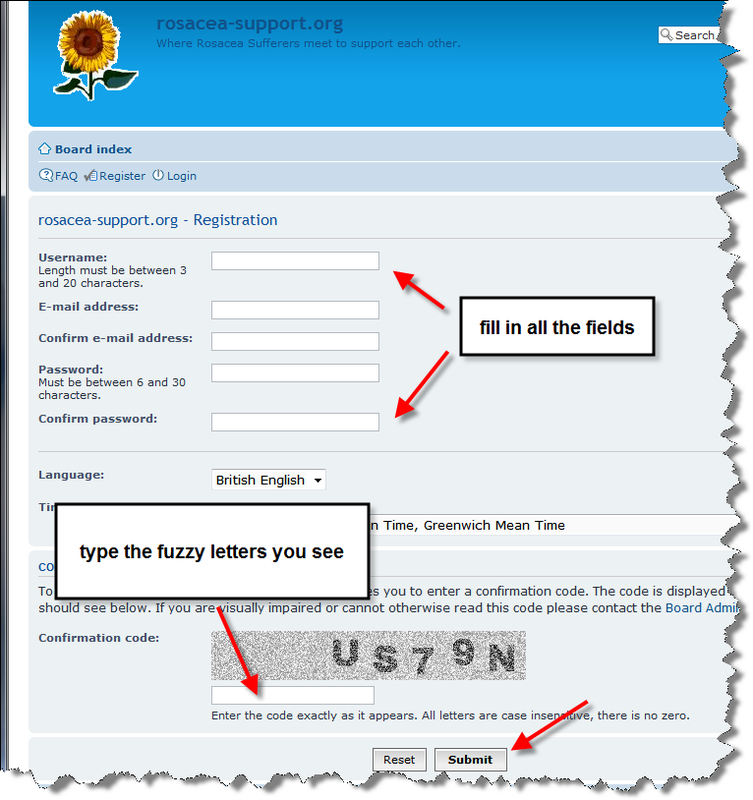 Create a username, password and fill in your email address. You will have to also type in the fuzzy letters you see at the bottom (this is so that spammers will find it harder to get into the board). Click submit. We will send you a copy of your username and password to your email account. 4. 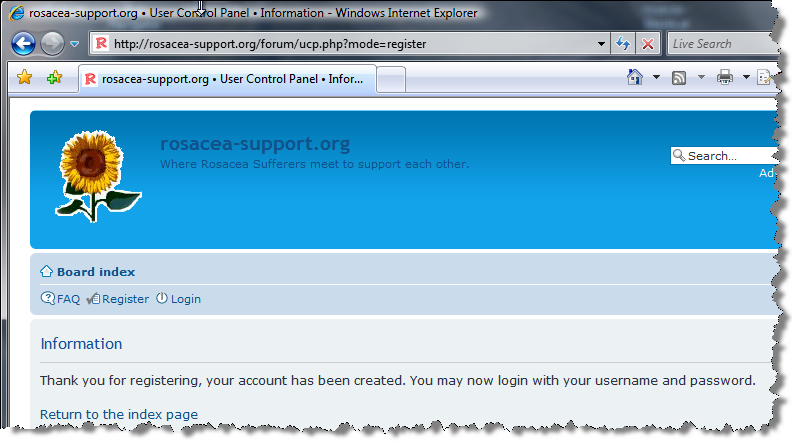 Now you are ready to login. Click the login link. 5. 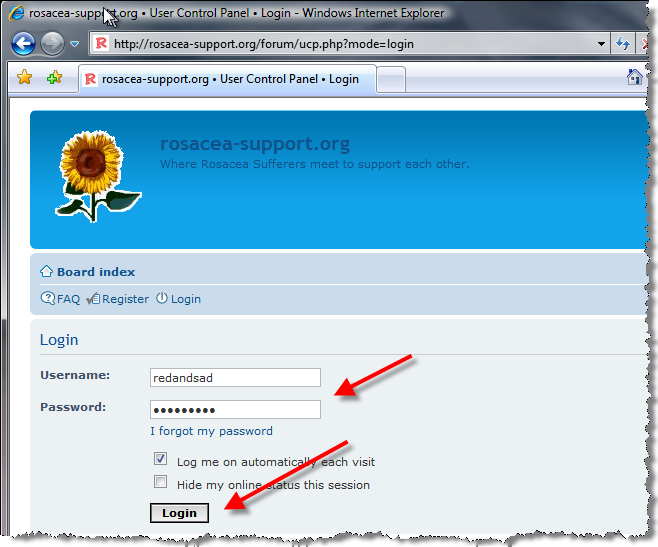 To login, use the username and password from above. Click Login. 6. Once you are logged in you will see your username mentioned near the top. Now you can choose one of the sections that you would like to read. 7. Once you are down in a section, click the NEW TOPIC button to start a new topic. 8. Fill in the subject, type some words and click Submit. That's it, after a short delay your new post will appear, ready for all to read ! 9. 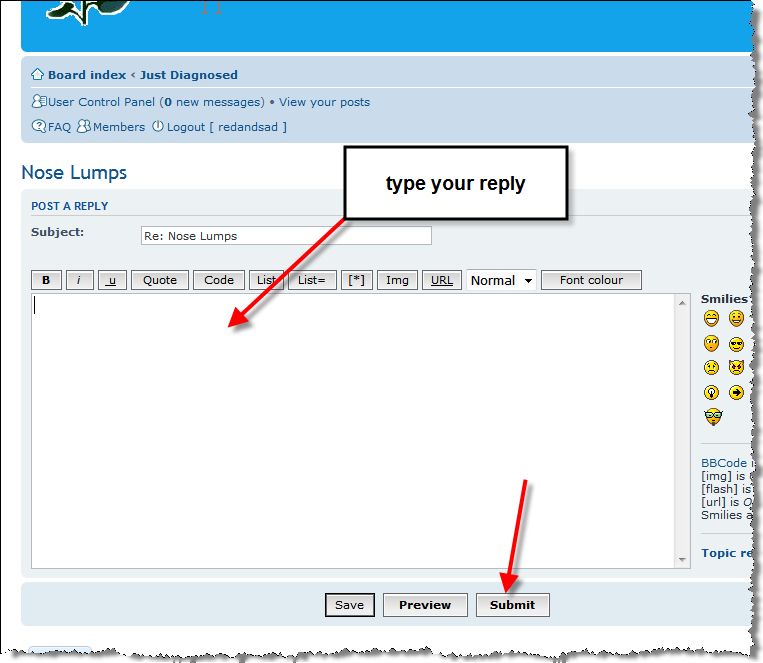 If you want to reply to an existing topic, click the POSTREPLY button and you will be able to add your own comment or question to the topic. 10. 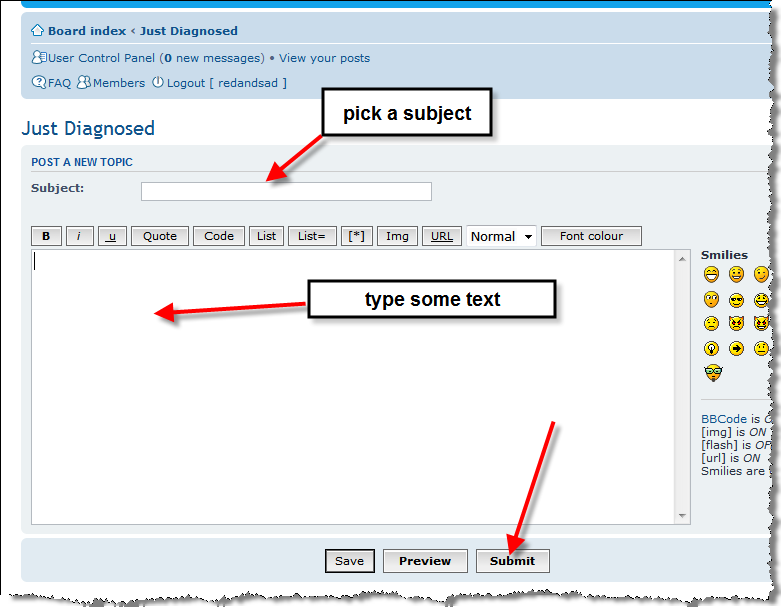 Much the same as creating new topic, just type some text for your comment and then hit Submit. So that's it. 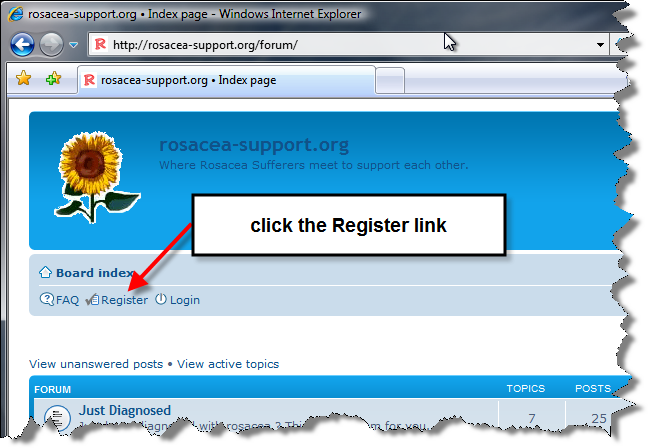 In just a few moments you will able to register and join the new Rosacea Support Community. Give it a go, you'll probably never go back ! Last edited by Aurelia on Sat Jun 14, 2008 4:50 am, edited 2 times in total. Thanks, David, for a superb effort. I guess a video clip wasn't needed after all. But what about PMs, eh? Belated PS: Love the baby photo. Nearly as adorable as little Elliot, who takes after his beautiful mama. You are in and posting fine. You should be able to navigate to the section you are interested in and post a new message there. Start with `Board index' at the top and go from there. Had chemical peel in Jan 2012, diagnosed with Rosacea last summer. Went to 4 doctors in town, they couldn't figure it out..I think because my main problem with this is a severe sun sensitivity, ended up with diagnosis at the University. Suffering, it has aged my skin and I wasn't able to be out in the summer, even with sunscreen and a hat, without my face feeling like it was on fire...and then came new wrinkles, my skin looks like sandpaper. I'm ok in a dark restaurant or in my home, but am finding it difficult to go anywhere cause I'm so self conscious. Has anyone else had this experience? I can't talk, or even write about it without crying, that's how traumatic it is! Just making sure I'm posting properly. I just joined this forum but am not new to rosacea. I am a 61 year old male and I have had rosacea for 40 years. I had teenage acne from the time I was 13 years old but when that acne finally subsided it wasn't long before the rosacea started up. Unfortunately, I never sought treatment until I was about 27. At first I went to a regular doctor and he treated me for adult acne and that treatment managed to make my face much worse. I tried all of the Clearasil and related products stuff and my face got even worse. I had pustules on my nose so bad that it was deforming the shape of my nose. The pustules seemed to be growing on top of each other. At that point in time I felt suicidal. I was young and wanted to go out on dates and the rosacea simply was too bad for me to be able to do that. Finally, just by luck, I drove past a sign that said that there was a new dermatologist moving into the medical center that was just down the street from where I lived. I made up my mind to make an appointment and that appointment changed my life. The doctor was right out of his residency and was very young. He took one look at me and told me I had rosacea. I had never heard of rosacea and was incredulous that there was a name to what I had. The doctor put me on Bactrim and asked me if I would like to undergo a dermabrasion to get help take the bumps off my nose. A week later I went through that procedure. It was an awful thing to go through but it eventually gave me back the original shape of my nose. That changed my outlook entirely. I felt like there was hope. 1.Avoid the sun- this seems to be the biggest trigger for me- use lots of sunscreen if you do have to go out. Avoid overheating, though. Do not get sunburnt on your face! 5.Avoid drinking or eating really hot foods. Avoid spicy foods. 3. I tried tea tree oil as a remedy for the demodex mite problem. The jury is still out on this treatment. I just started it and am not sure if it is doing any good or not. I do believe these mites are a problem because I can often feel them on my nose especially when I go to bed at night. I do not know if those mites are causing the pustules on my face though. The tea tree oil burned somewhat and since my face has pustules on it right now I have discontinued its use until my face clears up. 4. Pure sulfur seems to have had some good effect on my skin. I was buying it at a local health food store but have decided to buy it online because I can get it cheaper. It is my understanding that many drugs that treat rosacea have sulfur in them. It is my own opinion that rosacea is a genetically based skin disorder. I have read that it primarily affects people of Irish and northern European descent. My family is from Ireland and I have had several family members who have had rosacea. Most are deceased now but I do remember many of my uncles had deformed noses from rosacea. They were all heavy drinkers and all of our family members were convinced it was the drinking that caused this. I don't believe drinking caused any of it but I do believe it made their problems worse. That is all I have to add for now. For any young person who is just getting impacted by rosacea I say to you "hang in there!" Be glad you are young now and medical science is advanced more. When I was young there seemed to me to be no hope of ever curing this disease. Rosacea changed my life and my personality. Before rosacea I was outgoing and extroverted. After the outbreaks occurred it caused me to become introverted and more reclusive. It even impacted my career choices. I decided long ago to avoid jobs where I had to have a lot of face to face contact with people. I like people but I really had a hard time, at times, going to work when my face was really broken out. Many times people have asked me what was wrong with my skin. It is definitely embarrassing to say the least. Age hasn't helped my rosacea either. It never goes away but at least now I am retired and no longer have to face people if I choose not to. Hopefully, there will be a cure for this disease soon. The problem is that the research money is just not there for rosacea. If the disease were life threatening it would get more money. Looks like you are posting just fine. Hi Everyone. Just testing out a reply. I am new to the group. Looking forward to connecting with fellow rosacea "survivors".